Galatopita, (pr. Gha-lah-TOH-pee-tah) comes from the Greek words “Gala”, which means milk and “Pita”, which means pie. 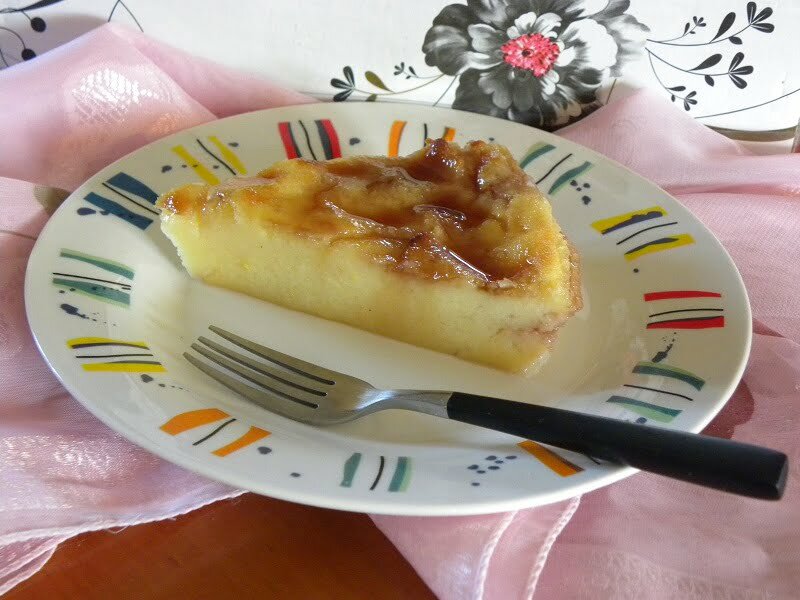 It is a simple semolina milk pudding baked in the oven. The traditional recipe is made with ewes’ milk but you can make it with any milk you like. It’s origin is from antiquity and the Ancient Greek dessert was named “άμης” (Amis, genitive amitos) , mentioned in Aristophanes’, Ploutos 981, Antiphon In “Dysprato” 1, Menand . en “Ypovolimaio 11”, etc. I’ve posted a recipe of Galatopita in the past, using phyllo and adding syrup, but this time I decided to make it more traditional, but still making a few tweaks of my own. In the first recipe I used sweetened condensed milk. Living in a small village, I usually keep some ingredients which may prove handy, just in case I need to make something and cannot go to Nafplio to buy the ingredients, on that day. One of these ingredients is sweetened condensed milk. This milk is rich and thick and when we were kids and wanted to eat something sweet, we would put some butter on a slice of bread and top it with condensed milk! This milk is great in puddings as it also adds a slightly caramelized flavour when baked. To enhance the caramel flavour, I brushed some butter on the Pyrex and sprinkled some sugar on top. During baking the sugar caramelizes, thus adding more caramel flavour to the dessert. The result is just amazing and don’t think that the dessert becomes overly sweet but perfectly balanced with the the flavour of vanilla and caramel prevailing. One day there was some leftover milk, which was about to expire, so I made this dessert in no time. Although the traditional recipe is made with sheep milk, which gives a rather distinct flavour, it is difficult to find this milk unless you know a shepherd. It still is good with cows’milk and we love the addition of the caramel, which I used in the previous recipe, so I added it here as well. The difference here is the burst of citron flavour, as I added lemon zest and citrus essence which made an equally delicious dessert. Whisk the eggs with half of the sugar with a hand mixer or a balloon whisk for 3 – 4 minutes. In a small pot, heat half of the milk with the remaining sugar, mixing so that it will dissolve. In a bigger pot add the remaining cold milk, the whisked eggs, the corn flour, the semolina the salt and lemon zest. Whisk until incorporated. Add the hot milk, whisking continuously. Put on the heat and continue mixing until the cream sets. Add the butter and lemon essence and mix to incorporate. Grease a 25.5 Χ 17.5 cm Pyrex with butter and sprinkle some crystal or brown sugar (about 1 tbsp) and some cinnamon. Add the cream and with a spatula make it even on top. Bake for approximately 40 – 45 minutes, or until the top starts to brown. Let the cream on a rack to cool so that the cream sets before cutting. Serve with icing sugar and cinnamon on top. Store leftover in the fridge. Note: If you will invert the dessert, you should do it while the dessert is still warm, otherwise the caramel will become hard and it will stick to the bottom of the pan. *My latest twist is making the galatopita with less sugar and adding on top some syrup. In this one I added some pomegranate syrup. When I made it again, when greasing the baking pan with butter and sugar I put it back in the oven and waited for the sugar to caramelize. It obtained a deeper caramelized flavour. In the cream I added orange essence instead of vanilla and served it with a slice of Orange preserve. The taste was even better! Galatopita (pr. Gha-lah-TOH-pee-tah), comes from the Greek words “Gala”, which means milk and “Pita”, which means pie. It is a simple semolina milk pudding baked in the oven. The traditional recipe is made with ewes' milk but you can make it with any milk you like. Preheat the oven to 180o C or 160o C for a convection oven. Grease a 25.5 Χ 17.5 cm Pyrex with butter. (If the butter is too cold, put it in the Pyrex and then in the oven, while it is being preheated). When it melts, sprinkle with the sugar. In a larger pot, put the eggs, milk, semolina and salt and mix to combine, using a balloon whisk. Add the water, mixing quickly with the balloon whisk and then put the pot on the heat. Stir continuously until the pudding comes to boiling point. Remove from the heat and mix in the butter and vanilla. Empty the pudding in the Pyrex and put it in the middle rack of the oven. Bake for about 30 minutes, until it becomes slightly golden on top. Turn on the grill and air and bake for about ten more minutes, until it becomes golden brown on top. Remove on a rack until it is lukewarm. Pass a knife around the edges and invert the dessert in a platter. Sprinkle with some icing sugar and ground cinnamon on top. If you will invert the dessert, you should do it while the dessert is still warm, otherwise the caramel will become hard and it will stick to the bottom of the pan. Heavenly! I’ll have to try this recipe soon. I have never had anything like this… it looks so tempting!